If you’re a destination-wedding bride looking for the perfect bridal look, then this week’s Cabo bridal hair and make-up is a must-see! 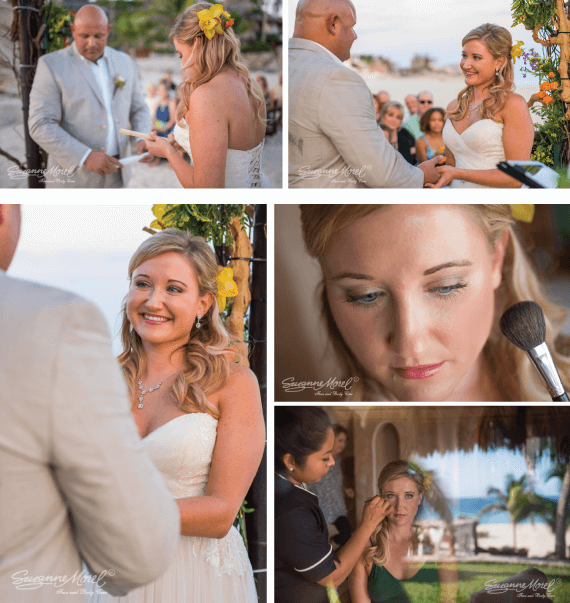 Beautiful Christine held her Cabo wedding ceremony at the beach and she wanted the soft, natural look that’s so popular right now. We styled her blonde locks in a wavy half up/half down-do with a large, colorful flower bloom behind the ear. Her make-up featured natural eyes and a pop of pink on the cheeks and lips. Christine wore this natural, beachy bridal look so perfectly—her groom Terry could not keep his eyes off of her! Our expert hair and make-up artists would love the opportunity to style you and your bridal party, so give us a call for your complimentary bridal consultation! This entry was posted in Cabo Bridal Hair and Makeup and tagged boho bridal look, boho bride in Cabo, cabo beach wedding, Cabo boho wedding, Cabo bridal salon, Cabo hairstylist, Cabo makeup artist, Cabo villa wedding, Cabo wedding salon, destination wedding bride, hair and makeup for a beach bride, hair and makeup for a Cabo bride, Mexico bride, natural wedding makeup.